Pour ceux qui valorisent l'esprit national et veulent essayer quelques jeux développés en France à prix réduit et tout en faisant un don pour des organisations de charité (Americaines ou Anglaises seulement, malheureusement), le dernier paquet humble est fait juste pour vous. Oops, I didn't see you there, non-French speaking readers. Sorry. Let me catch you up. 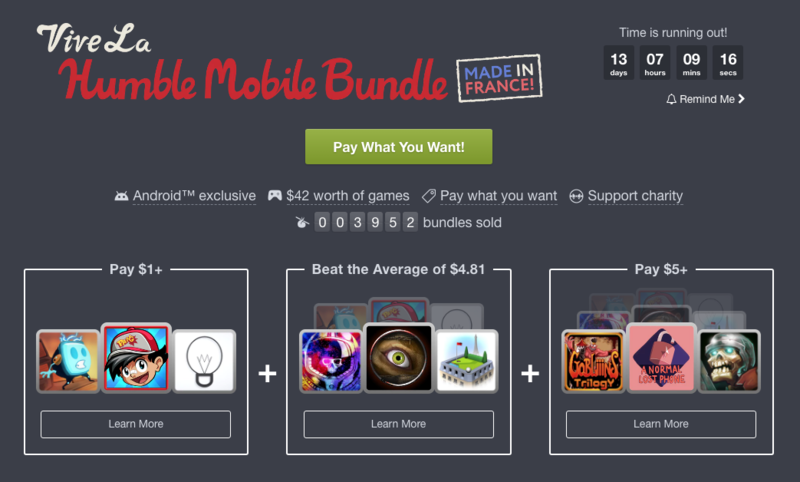 The latest Humble Mobile Bundle is all about games developed in France by renowned names like DotEmu, Playdigious, Mi-Clos, and more. It features 9 Android titles in the usual tier-pricing scheme. If you pay more than $1, you get arcade games Mechanic Escape ($2.99) and Pang Adventures ($3.99) plus typography puzzler unWorded ($2.99). If you pay more than the average, which currently sits at $4.81, you also get the highly praised Out There: Ω Edition ($3.99), adventure game Sanitarium ($3.99), and the really pretty OK Golf ($2.99). And finally, pay $5 of more and you unlock the third tier with the adventure game Gobliiins Trilogy ($3.49), mystery solving title A Normal Lost Phone ($2.99), and 2D RPG Dungeon Rushers ($4.99). All of these are very well rated on the Play Store, but keep in mind that you will be getting the DRM-free installation files. That means direct downloads from Humble Bundle's site and updates are reliant on the developers to keep the files up-to-date on the HB servers. And as with all Humble Bundles, you get to choose a charity to donate to. This month's featured organization is Action Against Hunger USA, but you can pick any other charity from HB's directory. Too bad those are all in the US and UK, with none in France. Would have been good if a French charity was provided as an option. If you're interested, the link to grab this bundle is below.